Walter White is mad, bad, and dangerous to know but what does the trailer mean? Let the downfall begin! 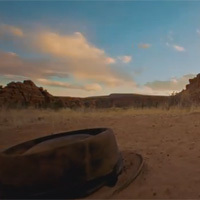 A few days ago, AMC posted a trailer for the final season of TV’s most addictive show, Breaking Bad. The moody, one-minute montage of time-lapse shots features barbed wire, sunbaked landscapes, and a voiceover by Walter White (aka Bryan Cranston) reading the poem “Ozymandias.” What does that mean? We pumped the show’s cast and crew for details about the upcoming season, which kicks off next Sunday (August, 11), but they wouldn’t reveal a thing. Instead, like everyone else, we’re trying to recall high school lit class to help us analyze the trailer. We don’t know much, but we know it doesn’t bode well for Walt. “Ozymandias” was written in 1818 by Percy Bysshe Shelley, a guy who palled around with Byron, married Mary Shelley (author of Frankenstein), and—in true Romantic fashion—died at age 29 before his beauty could fade. He also wrote a few poems. One of the most famous is “Ozymandias.” It’s about a despotic ruler who builds a monument to himself, convinced his name and works will live through the ages. Instead of an awe-inspiring statue, the poem’s narrator muses on the sad wreckage of a monument built for a long-forgotten lunatic. In other words, we’re going to watch Walter White’s empire fall apart. If last season’s cliffhanger ending with Hank finally connecting the dots between mild-mannered Walt and brutal Heisenberg didn’t already hint at that, this trailer sure does. Whatever Walt thinks he has built, get ready to see it crumble to dust. He’s mad, bad, and dangerous to know but somehow, we’re still rooting for the man in the black hat.